In this article, I'll describe about the circumstances where you can concentrate on your work continuously. I described that it was very important to see only information you need to concentrate on the work in the last article. I'll describe how I have incorporated this way of thinking into Dreamscope. There are various kinds of brain works and the necessary information differs according to a type of brain work. For example, you need the information about foods and recipes before you cook and you need the information about the state of your body and the strength training when you are thinking about the menu of your strength training. It's not special that the necessary information differs according to what you think about. Then, what is the brain work you do in Dreamscope? To put it simply, Dreamscope is the task management tool to practice the reverse thinking and you need to do brain works shown below to practice it. Set your values and identities. 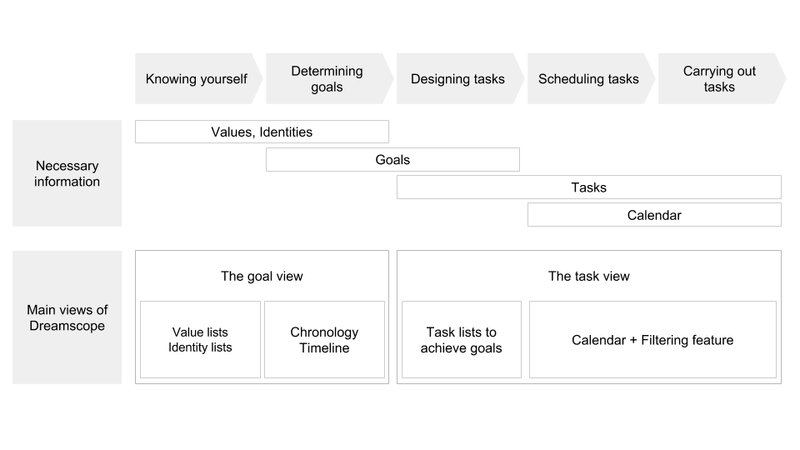 Design the necessary tasks to achieve goals by goal and set a date to each task roughly. Schedule tasks and make the time required for tasks per day less than the available time of the day. Confirm today's tasks and the time required for them. And complete tasks you have done. It's very important for you to have the easy way to access the necessary information and cut the noise in order to do these brain works smoothly. So I've added the feature to see suitable views according to a type of brain works and confirm the information from various perspectives to Dreamscope. Dreamscope has the following two views mainly. From "1. Knowing yourself." to "2. Determining goals." You can deal with the information in relation to values, identities and goals in the goal view. From "3. Designing tasks." to "5. Carrying out tasks." You can deal with the information in relation to goals and tasks in the task view. The suitable views according to a type of brain works are as follows. These views helps you concentrate on the brain work while seeing the information you need. In this section, I'll introduce the filtering feature that is useful for scheduling. The requirements for scheduling are two points shown below. You may find these concepts a little bit difficult to understand, but they are very simple and you should schedule tasks while thinking about these unconsciously. And the point is that the necessary information to check the feasibility differs from that to check the order. It's good that all tasks are shown to check the feasibility. On the other hand, it's good that only necessary tasks to achieve a goal are shown to check the order. In other words, as for confirming the order, tasks unrelated to the goal are noises and obstacles. In short, even though both the feasibility and the order of tasks need to be confirmed when you schedule tasks, the suitable situation to check them is conflicting. That's why you have some trouble scheduling tasks in paper planners, which are difficult to control the display, sometimes. Based on this point of view, I've added the feature to confirm these two requirements easily to Dreamscope. As for the feasibility, you can check the task volume for each day at a glance on the calendar because the total time required for tasks per day are shown on the calendar. On the other hand, as for the order of tasks, Dreamscope has a powerful filtering feature and this filter allows you to see only tasks under specific identities, goals or folders. Thus, for example, you can check the order of tasks under the specific goal easily. Also, the mode switching feature between business and personal life enables you to see only tasks related to business or personal life and check the total time required for only tasks related to each one. These features allow you to get an easy way to confirm the two requirements and schedule tasks. You can see the total required time by category like AM or PM in the week view or the day view. Also, you can see the tasks and the required time related to business in business mode. Please confirm the difference from the private mode shown below. You can see the tasks and the required time related to your personal life in private mode. This mode switching feature enables you to check the required time by mode i.e. business or personal life separately. Newer PostDo you use separate planners for work and personal life? Older PostDoes too much information disturb your work?